The 20-year-old northern pikeminnow management program has matured to the point of nearing a major milestone - reducing that species' consumption of juvenile salmon and steelhead by 50 percent from pre-program levels. "We feel all of our modeled prognoses are coming true," Russell Porter of the Pacific States Marine Fisheries Commission told the Northwest Power and Conservation Council during its December meeting in Portland. The pikeminnow program is funded through the NPCC's Columbia River Fish and Wildlife Program by the Bonneville Power Administration. The PSMFC coordinates the pikeminnow program. Since 1991, more than three million pikeminnow have been removed from the Snake and Columbia rivers through the sport reward program. In 2009, anglers caught approximately 142,000 pikeminnow. As a result, annual pikeminnow predation on juvenile salmon in 2009 was estimated to have been cut by 40 percent from pre-program levels. And that number is rising as more of the larger and more voracious pikeminnow (9 inches long or longer) are removed. "The average size has been gradually decreasing," Porter said. And the cumulative effects of the removals (a fish removed in 2008 counts toward reduced predation in 2009 and 2010, as an example). Pre-program research indicated that pikeminnow were responsible for most of the 10-20 percent mortality that occurs as young salmon migrate toward the Pacific Ocean through the eight-dam Columbia-Snake mainstem hydro system. Anglers cashed in 173,112 pikeminnow in 2010 to earn $1.2 million in rewards. One angler earned $81,366 during the six-month season, breaking the individual record for catching specially tagged fish that are worth up to $500. He hooked 13 tagged fish and earned $6,500 in the process. 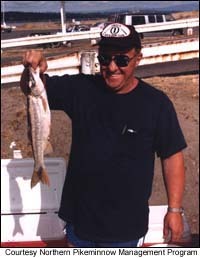 Anglers get paid $4 to $8 for northern pikeminnow 9 inches and larger caught in the lower Columbia (mouth to Priest Rapids Dam) and Snake (mouth to Hells Canyon Dam) rivers. The more pikeminnow an angler catches, the more the fish are worth. The first 100 are worth $4 each; the next 300 are worth $5 each; and, after 400 fish are caught and turned in, they are worth $8 each. As an added incentive, specially tagged fish are worth $500. One of those modeling predictions is that a sustained exploitation rate (portion of the reward-size population that is removed each year) of 10-20 percent would result in a reduction in predation of 50 percent. The exploitation rate in 2010 was 18.5 percent after subtracting tag loss. To estimate exploitation rates, researchers use electrofishing boats in the Columbia and Snake rivers to catch, tag and release pikeminnow. Then they calculate the percentage of those tags that are returned through the sport reward program. The program has in most years accomplished its goal of achieving a 10-20 percent exploitation rate. With the high rate this past year, the predation reduction calculation should be pushed up into the low 40s, he said.